Add more style & glamour to your looks with this unique turquoise blue colored suit. 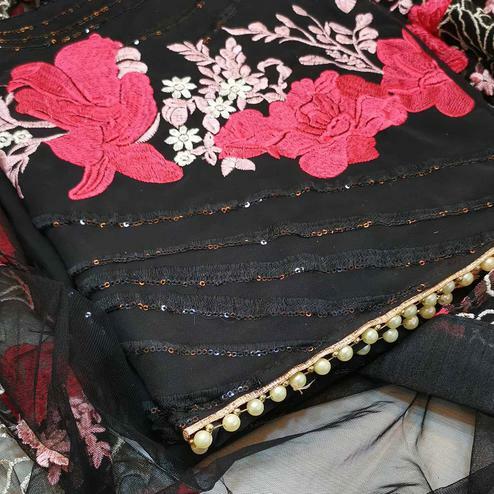 The top is made of soft cotton fabric which is stylized with beautiful resham embroidery with stone and print work. Comes along with cotton bottom, printed chiffon dupatta all synchronized well with the latest trend and style. Get this semi stitched suit stitched into a palazzo, salwar, churidar or pant style suit and flaunt your stylish look. Specially designed to wear for parties, social get together and family occasions, where you want to be center of attraction. Team this suit with ethnic accessories and high heel for a complete look and fetch compliments for your rich sense of style. This party wear suit won't fail to impress everyone around you.